Madras Curry Chicken or Tofu with Saffron Rice can be either made with chicken or as a vegetarian dish by using tofu instead of chicken. 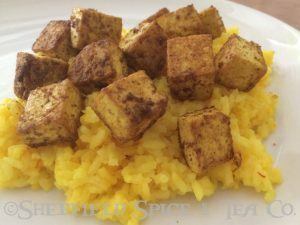 The picture is the recipe made with tofu. Since all of our Curry Blends have somewhat different flavor profiles, try it with the curry of your choice. The Madras Curry is a more typical in curry flavor. If you want a more complex flavor and a touch of saffron, try making it with our Maharajah Curry. If you want it hotter, try using our Vindaloo Curry. You can also use our Vadouvan Curry, to give it a French curry style. In other words, this recipe works with the curry of your choice. 3 Cups of cooked white, Jasmine or Basmati rice, prepared according to package. Prepare rice according to package directions. Add finely crumbled saffron to the rice while cooking. It adds a wonderful, earthy flavor and fragrance to the rice. Keep warm after finished cooking. Heat 2 tablespoons olive oil in a non stick fry pan over medium heat. When the oil starts to shimmer, add chicken and cook until sides are lightly browned about 10 – 15 minutes. Don’t overcook so remove from heat when cooked through. If you use tofu cook until the outside starts to get lightly brown and a bit crispy. Remove and set aside. Put 1 tablespoon of olive oil in the pan over medium heat. When the oil starts to shimmer, add the chopped onion and cook until translucent. Add the chopped garlic and cook for another for 30 seconds. Add the Curry Powder, mix well and cook for a few seconds until fragrant. Add the tomato and cook another 2 minutes. Add the chicken or tofu back into the pan and cook another 5 minutes or until heated thoroughly and coated with the curried tomato mixture. Serve on Saffron Rice, with salt added to taste. Top with a garnish of chopped cilantro.